I like good quotes, which is why I keep copying them into my posts. A good quote puts into words good ideas and points to wise and deep courses of thought. The day of good communications is known as Ik, the sign of the wind and spirit (among other meanings). In the glyph, the horizontal line represents the wind, and the perpendicular line is a tree. Trees and winds are intimately related in the Mayan culture, and might even be considered to be one organism. The wind carries seeds across great distances, and they fall to become new trees at new locations. The trees reciprocate by ‘calming’ strong and destructive winds down, softening and dispersing them, as they pass through them. In the same way, good ideas are like seeds that fertilize new lands when they are communicated (like a quote). A good idea moves mountains and meets deadlines with great gusto. It’s a glimpse of what a better reality could look like, which sets wheels in motion. Good communications are key in any community, be it a community of brain cells (as in good thinking) or a beehive (good honey) or a Kibbutz (good parties). Yesterday an act of violence, rooted in ignorance and bigotry, took place somewhere, and cut short an innocent life that was full of promise, now expired. It was sudden curtains on a beautifully casted role of a young martyr. His fiance’s grief-stricken face was on all the front pages, next to a photo of his smiling face. Over the course of 48 hours following the tragedy, a large host of readers and viewers synchronized in an invisible wave of empathy that rippled through wireless existences. The assailant was whisked away into the safe hands of secret government branches. The radical group by whose name he allegedly operated was shown again to be vicious and inhuman – the obvious enemy, deserving all available resources and fears. The large host of readers and viewers was unknowingly coerced into pidgen-holing and picking sides. So the host broke up into smaller, disempowered, and confused groups. Somehow, life goes on, and the wind keeps blowing. Spirit dwells within bodies and without them. When I am conscious of spirit it is near me, guiding my thoughts and actions, interfacing with this world through me. When I am not conscious of it, spirit still guides me, near though not within my attention. Note: this post is one of the few I haven’t written about in full yet. 1-Muluc is another, and 1-Ix is yet another. Ik is definitely one of the sun-signs I’ve never managed to pin down like I did for most sun-signs. I’m therefore publishing a partial post, hoping to fill up the gaps soon. 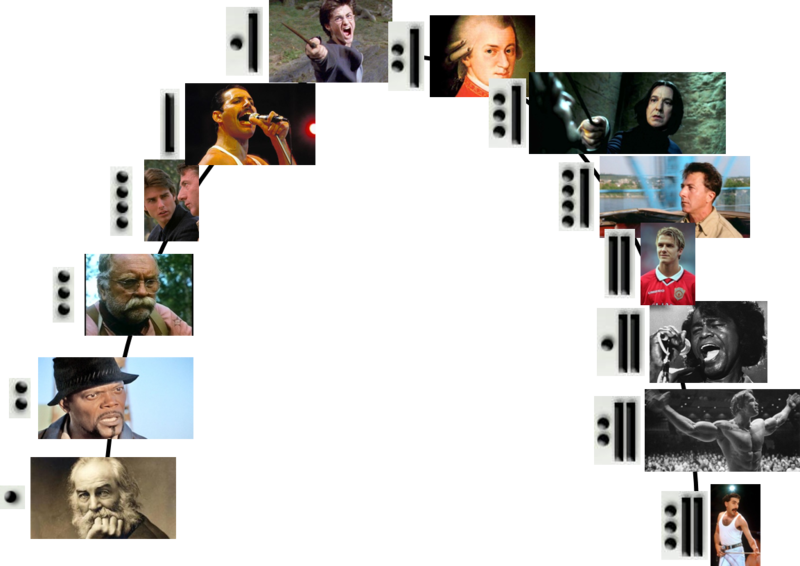 In the meantime, I’ve listed the celebrities, quotes, and sequence of day glyphs for the 1-Ik trecena. In the glyph, the horizontal line represents the wind, and the perpendicular line is a tree. Trees and winds are intimately related in the Mayan culture, and might even be considered to be one organism. The wind carries seeds across great distances, and they fall to become new trees at new locations. Good communications is key in any community, be it a community of brain cells (as in good thinking) or a beehive (good honey) or a Kibbutz (good parties). The sun-sign Ik (wind, breath) is involved with knowledge and communication. In western terms, I might refer to this as the quest for truth, along with the effort to faithfully disseminate it. Today’s sign, Akbal (night, house) has a flavor of the unknown and veiled aspects of experience and knowledge. To navigate the unknown a good measure of courage is required, and flexibility to adapt to new circumstances as the unknown is revealed. Together, 2-Akbal is a question of courage, flexibility, and resolve. These are the essential tools of any truth seeker. Courage to follow truth wherever it might lead; flexibility to stay on course and consider alternatives fairly; and resolve to reach the other side of the adventure and lesson. 3-Kan represents fertile seeds that the wind (1-Ik) carries to distant locations. The seeds travel in all directions. There are so many of them, so it doesn’t really matter where they end up, or whether they strike root or not. When distribution is carried out by the wind in all directions, some seeds are bound to become successfully in becoming new plants. Other seeds may lay dormant for years until their opportunity comes along. Time means little to good, fertile potential. The fourth day of the trecena is when the first cycle around the four cardinal direction concludes. It began in the north (Ik), then west (Akbal), then south (Kan), and today – east (Chicchan). Tomorrow it’ll be north again (Cimi). 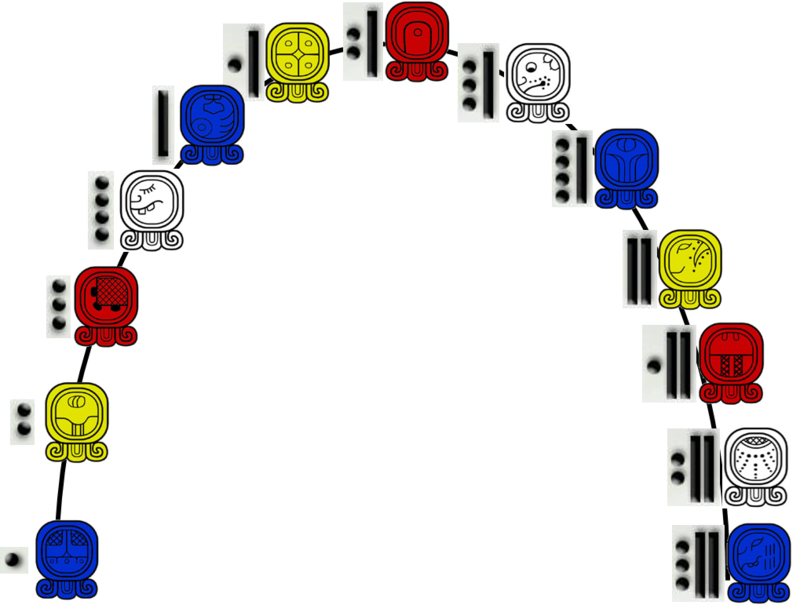 A trecena consists of 3 such cycles of 4 days (=12) plus one more day to evolve (13). So, as Ken Johnson often writes, a 4 day is a completion and perfection in itself. Even though there are still 9 more days to the 1-Ik trecena, 4-Chicchan represents a perfect set of requirements and limitations upon which the entire process depends. What are the requirements and limitations of Chicchan (serpent)? The final curtain fell before my eyes, and the void sucked me into total forgetfulness. I knew that most all I learn now will only be remembered by my body and my soul, and will remain forever beyond mental recall. Well, maybe not forever. That’s a mighty long time. Maybe I’ll get glimpses of it down the road, Déjà vu and insights that resonate completely. Maybe if I’m lucky, when I’m old and wise I’ll recall it clearly. If I’m luckier I might just be able to put it in words. I’ll be the luckiest if there would be someone else sitting next to me who cares to listen. The colors of dusk remind me of the colors of dawn. At the eve of my life, my body is old my soul is as a child’s. I’ll be listened to as a child, when I’m not totally ignored in the very same way. Then I’ll remember past friends and long-gone relatives. I’ll remember their deeds and their words. I’ll experience their council and dear companionship once again. One concept of time tells me I’m 41 years old plus 1 month and that’s it. That’s my current age, which I give when prompted. Another concept of time tells me I’m 35, 29, 15, and all other “ages” gone before – all at the same time (now). If I wasn’t all those previous ages – how could I possibly remember to do the things I learned back then? How else could I “behave like a child” or escape responsibility? This is depicted as the pyramid of time, built one floor above the previous one. My experience with the Mayan calendar has showed me yet another concept of time, which has a firm logical connection to the pyramid of time. It’s an improvement and inclusion of the previous two. I’m already old and wise. How can my soul be touched only by the past? As I mature, can I avoid emulating those adults I can’t even remember as having any impact on me as a child? Their spirit is alive in me. Spirit cannot be avoided, and Spirit has little to do with time. In the Mayan calendar, Spirit is depicted by the sun-sign Ik (among others). 13-Ik is the day that precedes 1-Akbal. Akbal is the Story of Spirit. It is the way spirit communicates through timeless stories, adapted and re-adapted again and again. The story itself remains the same, while my own understanding and application changes, evolves, ages, and ultimately dissolved back to Spirit. Akbal is therefore the story that I’m currently synthesizing and adapting to my time and place. I cut ideas and paste them next to others. I have my unique mix-and-match. I remember a personal experience that taught me much, ask whether it’s still valid today, and then realize it doesn’t matter. What I experience now is the spirit behind the story I’ll tell my children when we all get older and wiser. The 1-Akbal trecena spans most of the 10th uinal, which is the 20-day period in the Tzolkin round set aside for manifestation. Whatever I focused on since 1-Imix finally takes form in physical reality during this period. This doesn’t mean that manifestation in general takes place only now and again – remember that each trecena has a 10th day of “localized” manifestation, and each larger/smaller period of time shares this milestone as well. So, manifestation on the Tzolkin round scale takes place under the powerful and subtle influence of Akbal – the proverbial unknown. Ironic, isn’t it? The way things pan out in actuality cannot be foreseen during the extended period of incubation and preparation. For 9 uinals my intentions fermented below the surface, feeding on imagination, memories, wishes, thoughts, prayers, and fears. During 1-Akbal these intentions emerge from the void out to the light, as I begin to actually get what I asked for. However, because it cannot be foreseen in all its beautiful details until it manifests – it is unknown. This is why the 10th stage of each cycle of Time is ruled by the Mayan god of destruction. The chrysalis of imagination and expectation is destroyed and cast aside like a child’s old T-shirt. The world outside the cocoon cannot be fathomed from within it. It’s all just shadows cast on mommy’s tummy. Now’s the time to expect the unexpected; to assume responsibility for seeds sown long ago and far away. 1-Akbal is like planting a seed and not knowing what would grow of it. It represents the basic assumption that, on this plane of existence I’m called to constantly face the fear of the unknown within and without – and Learn! After unraveling a great mystery and coming out the other side it is time to enter another dark, scary and unknown cave and learn more. This period in Time calls for a fair amount of courage and inner integrity. Akbal is the most basic form of transformation, since it means going back to the dark womb of creation, realizing its boundless potential, and emerging wiser at dawn to teach and inspire the Waking Ones. In this trecena you’re bound to find many great talents of the stage, screen, and plasma screen. These will be mixed with several heads of state, a couple of lesser politicians, a late member of British monarchy, and a handful of prominent authors and poets. When I begin a trip to an unknown land (and I mean utterly unknown – like an unnamed island I know nothing about) one of the first questions I’ll ask myself is “will I find anything I like eating there?”. I get that feeling sometimes just before leaving for holiday. So the 2-Kan represents this type of basic dilemma of survival. It also relates to another human impulse of relating to anything unknown as something that would probably lead to nothing (as if the Known always leads to somewhere meaningful). As mentioned before, 1-Akbal is a test of courage, and 2-Kan is realizing that the unknown cave is deeper and much stranger than I imagined before. It is a day to deal with the urge to lose nerve and go back to the known. Thus, a measure of faith is called for. After all, I didn’t begin this journey to go back right after beginning. So 2-Kan eventually assists me in making the decision which is bound to yield at least a few good new contacts. That’s what Kan is all about. Here’s a journey in search of abundance beyond dreams, by Harry McClintock (2-Kan), recorded 1928. After overcoming initial fear, and giving up the known-zone, the dramatic Serpent Chicchan, representing the spark of physical life on the material plain, provides much needed enthusiasm, invigorates, and puts the entire process in motion. It is said that Man’s divine essence manifests in constant yearning, learning, and striving to solve the unknown. 3-Chicchan is actually this timeless itch to seek adventure and youth eternally. Speaking of being naïve, here’s a memorable scene from The Firm. Only recently have I realized the dialog features two actors born adjacent to each other in the Tzolkin. I’m pretty sure they haven’t acted side by side before or since (correct me if I’m wrong). That’s one of the most chilling exchanges I remember on film. It seems like a dead end, but ultimately becomes a necessary cornerstone in the evolution and growth of the Story and its Hero. 4-Cimi establishes the irreversibility of the current trecena’s evolution. It reminds me that the person who first entered the cave 3 days ago is already dead and gone, never to return again. This always seems to be true, but it is taken for granted and overlooked almost every time. Thus the illusion that I can actually remain who I was yesterday is fraudulently maintained as a subterfuge. However, the physical reality inherent in the 10th uinal cannot suffer any illusion or neurotic clinging to a frozen, past version of what’s already been transformed by the night (Akbal). So, 4-Cimi is establishing the fact that Form is always in transition (trans-form). This solid establishment allows the learning and unraveling process to continue. Manik (The Deer/Healing Hand) is a pilgrim, always striving to improve self and other; a constant process of aiming, achieving, and acquiring new tools for the next achievement. This ties in nicely with 1-Akbal, since it clears the air of past fears and negative doubts and sets the tone for the balanced phase of the process (stages 6-9). 5-Manik is the first time I witness a western sun-sign since this western trecena began. It is therefore a return the main theme + a modulation in harmony, which develops the process and makes it more precise. So without further ado, here’s a merry song of travel and homecoming. 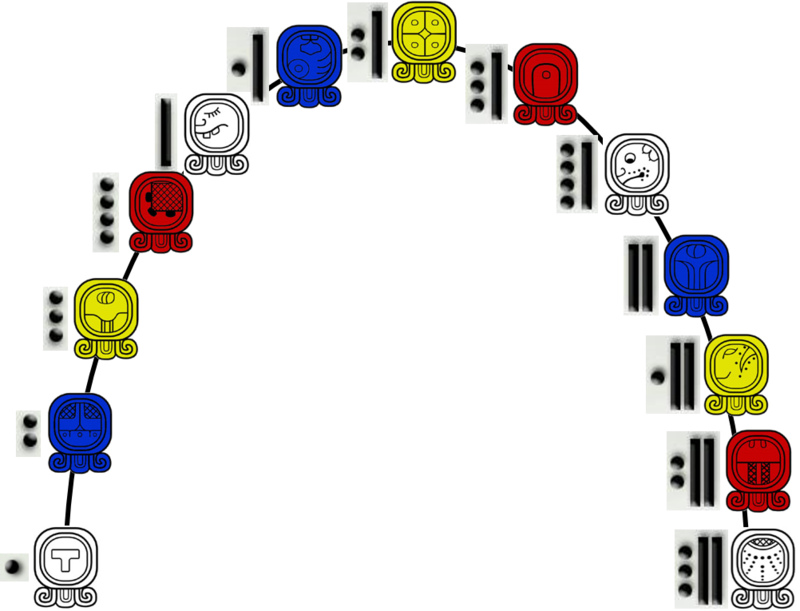 The 6th stage is the last stage which continues the original intent set in stage 1. On stage 7 the process already reverses its momentum, and whatever was inhaled is held inside before exhaling. The Star (Lamat) shines its light at Night (Akbal) and provides the all-directional responsiveness required to venture onwards. It gives just enough light to go on, but not enough light to dispel the darkness (not yet, that is). The 1-Akbal trecena core comes in the form of a day of depth and appreciation: 7-Muluc. When I reach the mountaintop of this trecena I can begin to come to terms with how deep my ignorance and lack of knowing has been so far (and will certainly be again on the next level, to be sure). 7-Muluc is when I dedicate myself completely to finding the dark places which scare me and then making the willful commitment to shine new light upon them. Today’s transmission from the Sun revolves around the all-pervasive nature of empathy and comradeship. After the “worst” of the night’s mystery and hysteria are behind me the balancing power of the 8th stage reminds me that I can never truly be alone when the faithful dog (e.g., Sirius, the dog-star) is ever my steadfast companion, even during the darkest nights. The dog archetype carries the symbolic theme of courage and daring; following the heart wherever it takes me. At any given trecena there are 13 sun-signs that are present and 7 absent. One of the more glaring absent sun-signs in this trecena is Imix. During the Akbal trecena there is an acute lack of territory and boundaries. The known becomes unknown, and the unknown gets more bizarre every day. This can be explained by the lack of Imix – the most material and territorial sun-signs on offer. This lack is compensated and balanced-out today by Oc and its social mode of territoriality, which is the force behind Team Spirit, All for 1 and 1 for all, and the All Seeing (invisible) “I” in the word “Team”. Remember the biggest jigsaw puzzle you’ve ever completed. The final piece of a puzzle remains a mystery, right untill the very last stages. Any piece I find can prove to be the final one, until I connect it. Once it’s connected it becomes part of the reality which assists me to complete more of the puzzle. In other words, I connect some sky pieces and come up to where the house and trees are. Then I can begin on those pieces. Problem is, in real life I get all the pieces, but I can’t find the game’s package and cover, where the complete image is shown. All I stumble across are other peoples’ game packages, or more precisely – the ones they are hoping to put together. This is exactly when today’s day-sign and stage both come very handy. Chuen is a new beginning, a rearrangement of existing materials, like the artist does. Chuen is the day-lord that might tell me: “first, connect two pieces that fit each other, pick up another piece, then repeat”. 9-Chuen is about a patient way of art. It requires a deep devotion to the craft and its intricacies. It’s the kind of devotion that makes actors change their daily routines completely to gain weight, for months on end, just for that perfect scene. Chuen-types are born for the limelight. They can be anyone they want to be, and convince you every single time. Some prominent Chuen examples from the silver screen are: Ford (2), Connery (4), Roth (5), Jacobi (7), Hoffman (9), De Niro (12) and Irons (13). All these stand out in their versatility, professionalism, and magical touch. I recall the day I entered the unknown cave and worried about sleeping bears deep inside. That was 1-Akbal. Then I began to fathom the cave’s depth, and started having second thoughts about whether it’s worthwhile to go on. That was 2-Kan. The serpent inside egged me on to test my nerve, hissing in Parseltongue about ancient and mysterious relics of knowledge and great worth buried deep under the Known. That was 3-Chicchan. Stumbling through dark and unknown passages, the ghosts of my ancestors came from all four directions to reinforce my courage and bless me with true resolve (and some luck, too). That was 4-Cimi. Dispelling my doubts, I took courage and marched on down the path of pilgrimage. That was 5-Manik. A lone star shone through an open shaft above; a white rabbit on the moon, as rapid wisps of clouds flowed across its phasing face. That was 6-Lamat. At the deepest end of mystery, I stopped measuring the depth of the hobbit hole, the deepest abyss of the soul. That was 7-Muluc. On the 10th level of the dungeon ambient light from all around me draw the outlines of the way out clearly visible. This is 10-Eb. Regardless of what I’ve found so far, nor what I might find on my way back to the LIGHT, once the Road becomes visible at Night, something deep inside me suddenly (and beautifully) attains a renewed sense of affirmation, self-worth, and maturity. I consider 10-Eb to be significant, since it takes place during the 10th uinal, and there isn’t any other 10th day in this uinal besides 10-Eb. So the focus turns to Eb and one of its meanings. The Dreamspell system (good morning, Jose!) calls Eb “human” or “man”, and I’ve also read some Mayan interpretations that resonate well with this meaning. To me, this ties in with Buddhism. There, it is written, that the way out of the six realms of Samsara (material confusion) lies within the Human realm. But that’s just a taste. After the road has manifested (10-Eb on the 10th uinal) comes the anticlimax 11-Ben. Finding a road in the dark is all well and good, but I’m not home yet. I need a guiding light and a sense of destiny (Ben). It wasn’t my fate to lose my way in the darkness, it seems. I can lead myself out now. Here’s FDR delivering the state of the union, 11 January 1944, just three months before he died. The Jaguar is a nocturnal predator. His vision pierces the Night. Thus, on 12-Ix (which is located next to the exit from the Akbal Cave) i find a pair of alien night-vision goggles buried next to an ancient Jaguar Warrior. These would surely come in handy next time I go on a night’s prowl, on a moonless night, somewhere in a faraway future of the next Tzolkin round. These are the tools and skills of the underworld shaman. On the other side of the 1-Akbal mystical process I find 13-Men, called “The Seeds of Vision”. It is said that Akbal people have a presence and voice which, by nature, inspire their surroundings, and make up the inexplicable question mark/scar of terrestrial existence. I found this to be quite true during my mysterious voyage down the Tzolkin and Mayan cave of wonders. This inspiration is carried today on the wings of the majestic, legendary eagles of the 13th and sublime Stage. They have bested all caves, and are forever soaring above in search for a new mystery to dive into. This eventually leads to the next story of evolution: The Sanctity of the Unified Soul (1-Cib). Finally, here’s Trent Reznor (13-Men) getting involved and attached all the way. You know, like 13 does.